I was blown away by this coffee. I typically dislike flavored coffees as they are usually overpowering and/or artificial tasting. 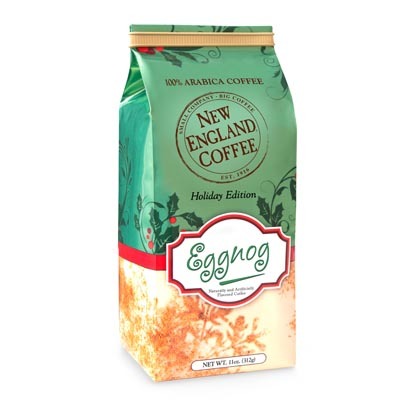 Instead of being an eggnog flavored coffee, this product features NEC’s signature smooth coffee flavor with a subtle hint of eggnog taste and aroma. I just wish I got my hands on more of it before it ran out. 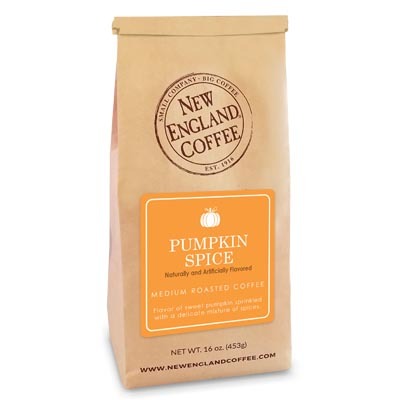 My favorite of all the New England Coffees. Please let me know when it is available again. This is a fantastic flavorful coffee . I purchase enough for the whole year . It would be nice if you produced this starting in November instead of December for a longer selling time . Looking forward to purchasing it again . This coffee flavor for the season is wonderful!! Been waiting for you to replenish it!! Please make it available again before the end of the Holiday season!! Thank you……I’ll be looking for it! I’ve tried several other brands of Eggnog coffees and didn’t care for most of them. 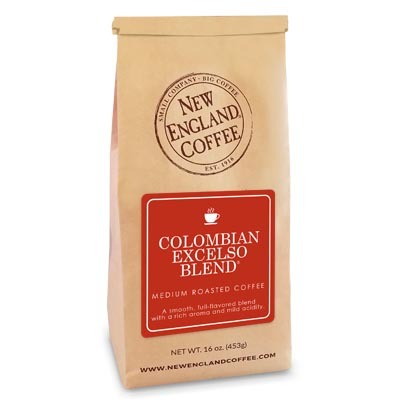 Since I’ve enjoyed most of the other New England Coffees and was placing an order for more I decided I would give this one a shot not expecting much. It still sat for a couple weeks after I received it because I was hesitant, but after giving it a try I was amazed. I will be buying a bag of this one again next year if offered. i was smart [or so i thought] i bought 12 bags in december …..all gone can’t wait to see it again! A delicacy worthy of year-round offering! Creamy nutmeg undertones don’t overpower the senses, and I’ve even served it over ice with sweet cream! So thrilled to see it back on the menu, even if for such a short time. Our absolute favorite coffee ever!!!! Eggnog is a favorite in our house! The best ever. Been looking out for the New England Holiday line to come out and I am so disappointed not to find this!!!!!!! You really need to get this out. I found it once on clearance because the store had not displayed it properly. Not good, you need to promote it and it WILL take off and become a Holiday tradition. One taste and your hooked! The window for buying this coffee is far too short. I somehow missed it this year. It is the only flavored coffee that I drink, and I drink this year-round when I can get my hands on it. I drive from market to market to buy enough to store in the freezer for those long months until it becomes available again. Please make more! My store is sold out. I buy one very year and have it through the year. Would drink it more if you made it available all year. I tried this coffee after finding it on clearance in December 2017, and WOW! I bought four bags, and am waiting on pins and needles to get it again! I gave a bag away and am nearly out myself. When does this come out, and how can I get some? I never even noticed it on the shelves before. One of my all-time favorites all year long now. I’ve been looking the past few years for a good eggnog flavored coffee to replace another brand’s that was discontinued. This is it! Actually, it’s even better. 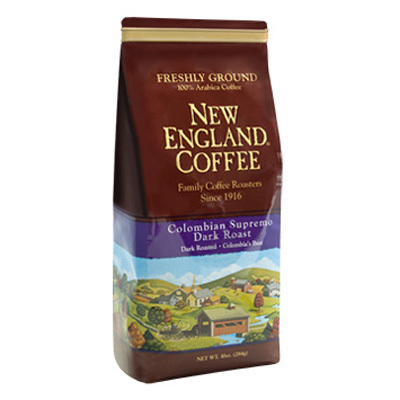 I didn’t know New England Coffee was available online. They have so many flavors here that I never see in the supermarkets. I never realized they had so many varieties. Will definitely be trying more. The best Eggnog flavored coffee that i have tasted yet. Now I want more. Santa, please carry this flavor all year round.